Problems and difficulties, apart from our personal lives, are also a part and parcel of almost every single business venture in the world, the only difference being the magnitude of these problems and the implications that follow. Still, there are businesses flourishing everywhere in the world by overcoming the problems on day to day basis and sometime I wonder how and why would this be happening? This happens because of the leadership of that particular business organization which is locally aware and has business acumen. Leadership is everything that changes the course of progress to success. 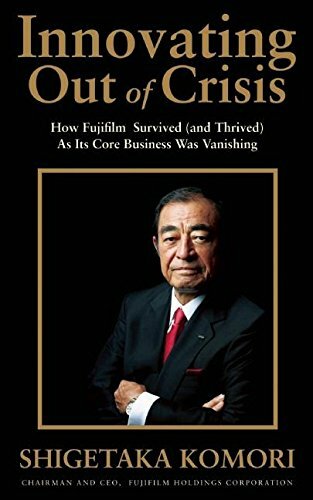 I recently read a book, Innovating Out Of Crisis, written by Shigetaka Komori on How Fujifilm survived (and thrived) as its core business was vanishing. Mr. Shigetaka Komori is the Chairman and CEO of Fujifilm Holdings Corporation and the book, Innovating Out Of Crisis is the firsthand documentation from his early days with Fujifilm to lead it from the highest leadership position. The book, Innovating Out Of Crisis, is divided in two halves, first being called "Fighting for Fujifulm" wherein he writes about how the core business was about to vanish due to technological revolutions taking place outside the organization and with the advent of digital photography, the ease of use, concerning to storage and retrieval of photographs by the end consumer was becoming easy and the camera rolls were to become obsolete soon. He further writes about the courageous acceptance of reality by the organization and how they started exploring different business verticals and also looked at diversification with intent. This diversification was not only limited to the photography and filming business, but also outside of it. There is also mention about the structural reorganization on the basis of merit for smooth transition at all levels. The second half of the book is called, "Managing for Victory" wherein the author, Mr. Shigetaka Komori, writes about importance of understanding the present business, economical, global and industrial situation to plan market and speculate the near future only to be ready for it, but he also emphasizes on how the misreading of present can hamper the future in the long run. Another important thing written in this section is about the meaningless wins and the strengths that you possess, author emphasizes not only on the implementation of your plan, but also how you implement and strive for constant success. There is absolute focus on Honesty, integrity, intelligence and competitive spirit, as these things inspire you and your ability to focus on the ultimate goal. The culminating part of the book, "Innovating Out Of Crisis", is beautifully as well as thoughtfully written and has some real life lessons culminating from the years of experience and the ownership of work as well as fulfillment of responsibility. Mr. Shigetaka Komori, author of the book, Innovating Out Of Crisis, constantly reiterates about the learning on the go and whatever you do, you should do with utmost seriousness and responsibility. When you do so, you sail through very easily. There are many learning from the book for the personal as well as professional life, as both your lives are affected by the other in some way or the other. At leadership positions, one should also have belief in their gut feelings while leading a team as it is easy to lead than to think about how to lead. Another important message is to accept change and embrace it so that you can easily adapt it for your business, which in turn will only do good for it, but the important part of knowing about the change completely. It is not only about being aware of the competition, that is okay, what is also important is what you do with the awareness, how you learn and implement from the awareness is of utmost importance. Most people fail when they only focus on success, rather the victory lies in focusing on long term success. It is not easy to be a thinking leader, you constantly need to upgrade your skills at levels from business to family, but it is easy to be a consensus leader. Consensus leaders often fail in the long run. I would recommend this book to everyone starting the careers to read and not only be inspired, but also learn a lot about leadership and success.